In the course of trying new recipes, I've found several amazing successes that I wanted to make a staple of my repertoire. But many of them never show up again at the table, having been pushed aside by a new culinary delight or a new cut of organ meat, even more obscure and labor-intensive to prepare than the last. Because of this, I'm especially tied to recipes that I return to again and again. They just strike a cord in me that creates an echoing hunger in my soul, resonating within the depths of my being again and again. This is one of those recipes. My mother wasn't one to keep sugary junk food in the house; but there were always pretzels. I love the substantial crunch of a salty pretzel, especially when I would push a whole handful in my mouth and feel the salt dry the inside of my cheeks and lips to a tacky, leathery finish. My mom would dip hers in blue cheese, while I opted for mustard. I'm not quite sure where the pretzel idea came from, but I think it was sparked by a local pub that made calzones baked in pretzel dough, instead of a normal pizza crust. The catfish came in because it's a delicious, meaty white fish. And cheap. And it's great for frying and broiling and all other kinds of cookery that would rip up a more delicate fish. So to start, the catfish are rolled in seasoned flour, then egg wash, then crushed pretzels. The most beautiful way to cook these fish are to bake them in a 400 F oven. 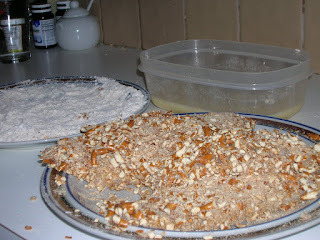 This way you can use larger pieces of pretzels, and the crust won't get too dark (as pretzels are dark-skinned to start with). 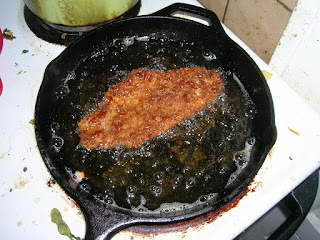 But I also like frying them because it makes for a very juicy fish, along with a crispy-crispy crust. 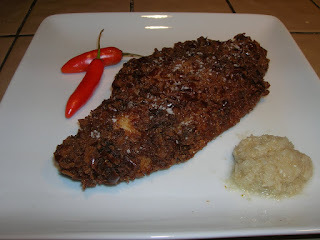 A creamy mustard sauce is my favorite way to eat pretzel-crusted catfish, but tonight I opted for the pungent bite of horseradish to help fight the chill off. Simple, straightforward, and delicious.